The Reports module of Zoho Books has a standard set of reports which you can generate to know the financial health of your organization. Even though these reports address the requirements of a majority of businesses, there is always a need for customization depending on the type of business. Advanced analytics a.k.a Zoho Books - Zoho Reports integration allows you to create highly customizable reports and dashboards to visualize and track key financial metrics from your Zoho Books data. Get access to a full-featured business intelligence (BI) and reporting tool that can slice & dice your Zoho Books data to create any report/dashboard you require. Create your own reports and dashboards based on your Zoho Books data or from any other data sources and popular business applications. Share reports and dashboards with your colleagues. Schedule and email your reports whenever you want. Export your reports as PDF, HTML, Excel, CSV and image files. Embed your reports in websites, blogs, etc. To view the list of available sample reports, click here. 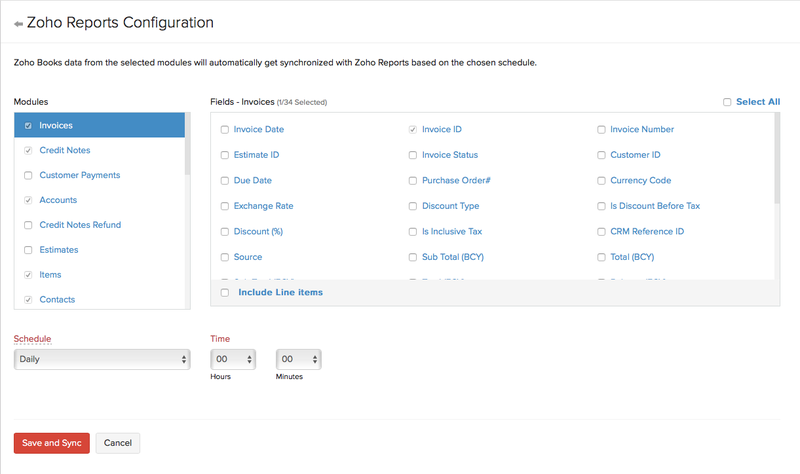 For the integration to work, you should add and enable the Zoho Books add-on from within Zoho Reports. The add-on enables you to import your Zoho Books organization data into Zoho Reports for advanced reporting and analysis. Any Zoho Books user who is an Administrator of the organization in Zoho Books can configure this add-on to analyze their Zoho Books organization data. Please note that, only one setup is allowed per organization in Zoho Reports. The Zoho Finance Advanced Analytics connector powered by Zoho Reports is available in all the paid plans of Zoho Reports (starting from ₹1000 per month). This will empower you with financial analytical capabilities over your Zoho Books data. Apart from that, you can also create insightful reports & dashboards for in depth financial analysis. Learn more. If you’re already a Zoho Reports user, and have a paid plan, you can use the add-on for free. 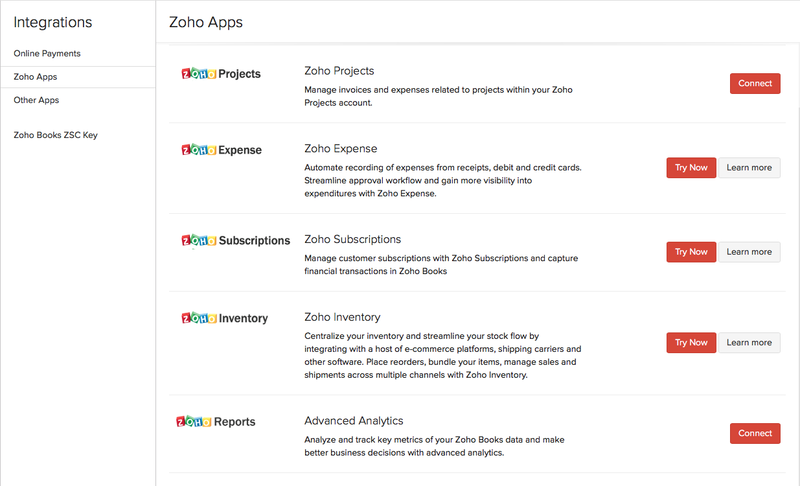 Log into your Zoho Reports account and click on Subscription on the top-right corner. Click on the Upgrade tab. Look for the plan that you’re in and click on Manage. In the page that follows, check the Zoho Books Connector option to enable the add-on. Note: If you’re in the free plan, you’ll have to pay for the add-on. Log into your Zoho Books account. Under Integrations, select Zoho Apps. Scroll down to Zoho Reports and click on Connect. In the page that follows, click on Configure. You will be taken to a page where you will be asked to choose the modules whose data you wish to sync with Zoho Reports. Select the modules and their respective fields whose data you wish to share with Zoho Reports. Choose how often you wish to sync your data with Zoho Reports; you can choose to do it once, once in a few hours, or every day at a particular time. Choosing None under Schedule option will sync the data only once; at the time of integration. Once done, click Save and Sync. When you setup this integration, your organization name, organization ID, user name and address will be shared with Zoho Reports. Once the setup is completed, it will take some time for all the data from your Books account to be transfered to Zoho Reports. Please note that you cannot make any changes to the settings until the data transfer is complete. 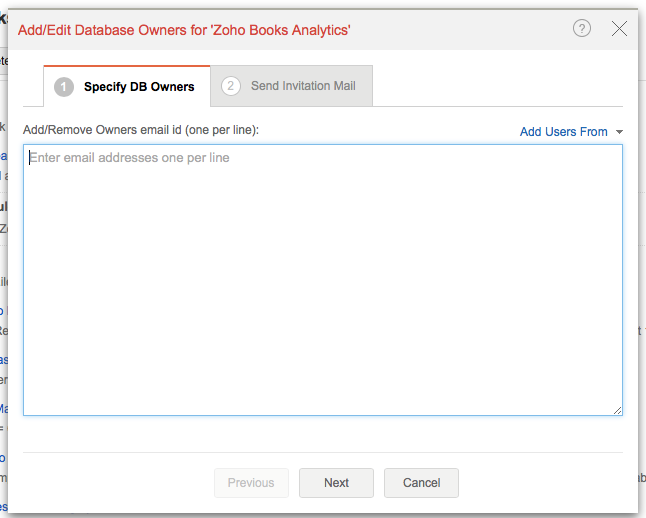 You will receive an email after the data from Zoho Books is imported into Zoho Reports. Once the data is synced, you can generate in-depth reports by navigating to the reports section. Click on the Reports module from the sidebar and click on Advanced Analytics at the top right corner of the page. You will be taken to your Zoho Reports account where you can view all the data that was imported from Zoho Books. Apart from accessing pre-defined reports, you can also create your own custom reports and visualize them in different formats such as bar chart, pie chart, etc. To know more, click here. Select Reports module from the sidebar in Zoho Books. Click on Advanced Analytics on the top right side corner of the page. In the Zoho Reports page that appears, click on Share option. 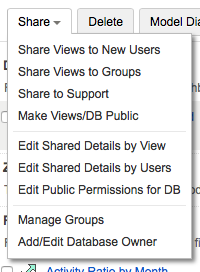 Here you can choose whether to share views with users/groups and edit the permissions provided and add/edit database owners. Choose Add/Edit Database Owner from the Share drop-down. In the pop-up window that appears, enter the email id of the user, whom you want to add as owner and hit Next. You can choose whether notifications should be sent to the newly added members or the deleted ones. Select Add to send an invite to the user. Click the Gear icon on the top right corner of the Zoho Books home page. Go to Integrations –> Zoho Apps. Scroll to Zoho Reports and click on Show Details. In the page that appears, click on Deactivate. To know more about Advanced analytics integration, refer to Zoho Reports help documentation.